We offer a range of talks, tours and workshops designed specifically for adults throughout the year. There are individual public events listed in the What’s On section or you can request a specific talk for your group. Garman Ryan Collection which includes works by Monet, Picasso and Van Gogh. We offer FREE introductory talks about the family history and the Collection every Saturday at 1pm, meet in the main hall of the Garman Ryan Collection Galleries on Floor 1. -Talks last approximately 20 minutes. –FREE Drop in, no booking required. -All talks 30 minutes unless otherwise stated. -Tours are charged at £30 for 30 minutes. 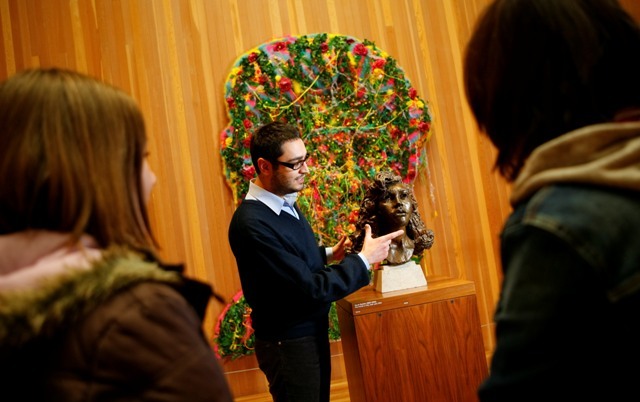 We offer behind the scenes tours to explore the hidden depths of the Gallery. These are only available as part of special event days or you can arrange a bespoke tour for your group. A private tour for your group about the Collections or Temporary Exhibitions can be arranged upon request to fit with your requirements.